Looking for that perfect gift for parents? 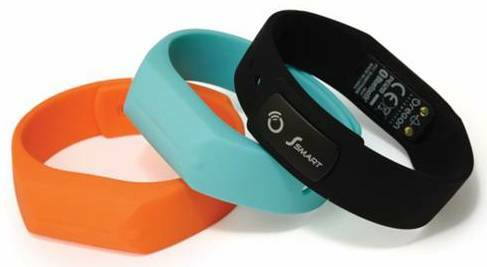 Check out the Ssmart Dynamo Activity Band! The Ssmart Dynamo activity band from Oregon Scientific is intended to inspire a healthier lifestyle by tracking fitness goals, activity, and sleep while wirelessly communicating data to mobile devices using the latest Bluetooth Smart technology. During the day, the activity band tracks physical activity including steps, distance traveled and calories burned. When the sun goes down, it offers nightly sleep tracking, including rest time and actual sleep time. An easy-to read, four-color LED indicator keeps the wearer informed of their daily activity level that can be stored for up to 14 days and the unisex activity band offers maximum comfort and features a built-in rechargeable battery that holds a charge up to two weeks. The Ssmart Dynamo is compatible with iPhone 4S, iPhone 5, iPhone 5S and devices using Android 4.3. The MSRP of the Ssmart Dynamo is $79.99. Buy it online at the Oregon Scientific Estore! The 2013 BabySavers.com Holiday Gift Guide may contain advertising or promotional information provided by the manufacturer or PR representative. The gift guide is intended as a shopping guide for the holiday season, and this post should not be considered a product review or endorsement unless otherwise stated. As always, feel free to contact me if you have any questions.